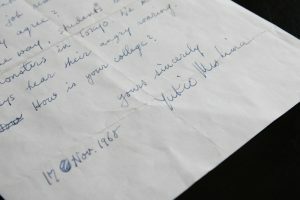 The Lisa Sainsbury Library holds a letter written in English by Mishima Yukio, who is considered to be one of the most distinguished literary figures of 20th century Japan, to the late Professor Geoffery Bownas in his lifetime. Geoffrey Bownas’ involvement with Japan began when he was drafted into the army in 1942 while still a student at Oxford University. It was in the army where he learned Japanese in order to decode Japanese transcrips. He later established the Japanese Studies department at Oxford University in 1954 and became the first Professor of Japanese Studies in 1965 at Sheffield University. Professor Bownas was also a devoted friend of the Institute and has supported and donated resources, including the letter from Mishima, since the Lisa Sainsbury Library was established. Mishima begins by referring to his previous meeting with Bownas. The collaboration Mishima is referring to here is to edit the ‘New Writing in Japan’, a part of the Writing Today series published by Penguin Books. New Writing in Japan is a translated anthology of Japanese contemporary literary works that includes Patriotism by Mishima, The Catch by Oe Kenzaburo and poetry by Tanikawa Shuntaro. Mishima continues with his amicable regards by writing ‘I am delighted to have you’ and suggests he held Bownas in with trust and confidence. The plain white sheet of 7 ½ x 10” paper, which Mishima enscribed using blue-black ink, is a rather unconventional format used in Japan and the eccentricity of his paper choice is very much in Mishima’s aesthetic style. 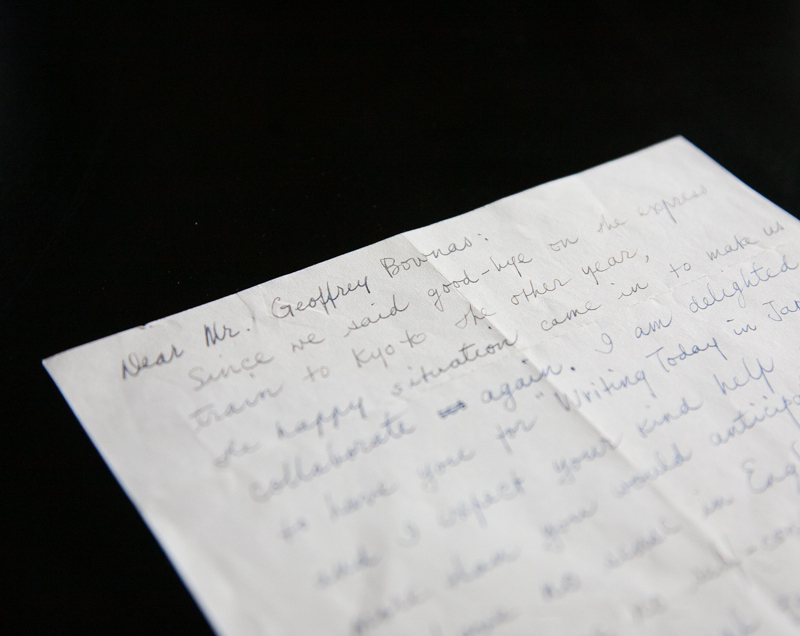 Mishima wrote on both sides of the paper with strikethroughs on a few words as though Mishima knew Bownas well enough to send a letter with a few minor imperfections. effectively as they co-edit the publication. Here again, Mishima’s high regards for and casual relationship with Bownas are palpable. always hear their angry roaring. How How is your college? He is referring to the student demonstration that has become increasingly boisterous during the year this letter was written, with speaking choirs appearing throughout Tokyo. For a far-right patriot who dreamed of Japan restored to imperialist power headed by the Emperor, the ideologies promulgated by far-left radical students who were galvanized by the aim to overthrow traditional social system went against his grain. Perhaps the student demonstration pushed Mishima’s already right-winged thinking to a deeper extreme. Two years after writing this letter on 25 November 1970, Mishima committed ritual suicide after a spectacular display of remonstration at the former Imperial Japanese Army’s General Staff Office (present day Japan Ground Self-Defense Force camp). New Writing in Japan, co-edited by Mishima and Bownas, was published posthumously in 1972.